Today we a new product that we’re excited to release! 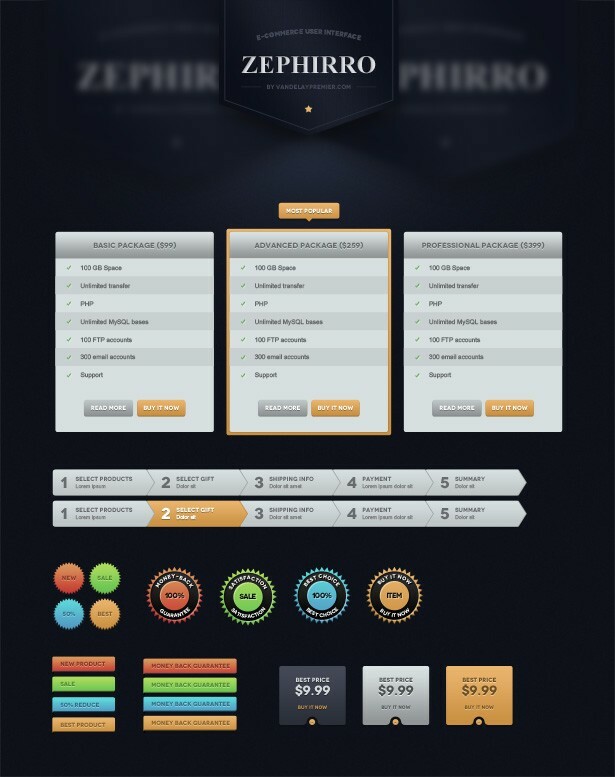 It is a huge UI set that includes the elements most commonly used when designing e-commerce websites. With Zephirro you can quickly and easily design e-commerce sites for your own use or for clients. Zephirro includes elements like pricing tables, feature boxes, shopping cart, shopping cart widgets, checkout progress bars, checkout, product listing, product detail, user reviews elements, product options like dropdowns and checkboxes, badges, ribbons, notifications, chat support, a login form, navigation menus, and even newsletter sign up boxes. With all of these elements, much of the design work is already done for creating an e-commerce website. The set includes a total of 4 PSD files. Each element is layered for easy customization and editing. You can make some customizations for each e-commerce site you design and use some of the same elements over and over again to save time in your design process. The premium set is available for just $10/month as a Vandelay Premier member and comes with our standard multi-use, extended license. That means you can use it on as many projects as you would like, including templates and themes that will be sold or given away, with no need to buy a developer’s license. Full license details are available here. And if you’re a Vandelay Premier member you can download Zephirro at no additional cost. Click on the images below to view them in full-size. Zephirro was designed by Grzegorz Grzelak in partnership with Vandelay Design. The fonts Novecento Wide and Arial are used in the PSDs. To start using Zephirro and to speed up your design process, get it here. We’ve put together a smaller collection of the resources that can be downloaded for free. It comes with the same license (use on commercial projects is allowed), so please try it out.